Test and Analysis by Osaka University of Pharmacy, published at the 1990 Pharmacology Convention. Daily consumption of Ashitaba can help keep cancer at bay. Dr. Okuyama and his team in Tokyo Meiji University of Pharmacy discovered that chalcones from organic Ashitaba can inhibit the activity of carcinogens or cancer promoting substances. In their experiment, Dr. Okuyama and his team introduced carcinogens and cancer promoting substances into mice. Half of the mice were treated with Ashitaba-derived chalcones, while the other half were not. The group of mice that was treated with Ashitaba-derived chalcones had significantly lower rates of cancer development. The same experiment was conducted for skin cancer and it was found that mice treated with Ashitaba-derived chalcones inhibited the development of skin cancer significantly. Organic Ashitaba improves stomach and digestion health through its rich fiber content. An example is that Ashitaba contains twice as much fiber as spinach! Ashitaba also helps to relieve stomach ulcer issues. As a natural ingredient without side effects from chemicals, Ashitaba is able to reduce gastric secretion. This in turn increases the stomach’s efficiency, protects the stomach lining from being eroded by digestive fluids and prevents stress-affected stomach ulcers by up to 70%. Since the two chalcones also possess antibacterial properties, organic Ashitaba can help heal gastric lesions. Research carried out by Dr. Yoshihiniko Inamori of Osaka University of Pharmaceutical Sciences showed how xanthoangelol and 4-hydroxyderricin inhibit the growth of straphylococcus aurerus and staphylococcus epidermidis, the two main bacteria that can aggravate gastric lesion infections. Breakthrough research presented at a 1993 Pharmacology Forum in Japan reported that Ashitaba’s unique chalcone, xanthoangelol had the astounding ability to stunt HIV growth before it proliferates. This anti-HIV activity is further boosted by Ashitaba’s high antioxidant content that simultaneously strengthens the natural immune system. According to research by Dr. Naoru Fujita of the Osaka University of Pharmaceutical Sciences, Ashitaba’s unique chalcone xanthoangelol prevents blood platelets from coagulating. When blood platelets coagulate, blood become very concentrated and dense. This can lead to blood clots and resulting heart attacks. Not only does xanthoangelol have anti-coagulation properties, but together with 4-hydroxyderricin, it also can prevent blood vessels from shrinking. Organic Ashitaba is therefore very effective in preventing high blood pressure, hypertension and heart diseases. Scientists at the Biomedical Group of Takara Shuzo Co. Ltd have discovered that Ashitaba can stimulate natural production of Nerve Growth Factor (NGF) inside the body. This is extremely valuable since NGF cannot be obtained by any type of injection or digestion. NGF is a protein that helps neurons maintain connection with the brain, and thus has potential to alleviate Alzheimers and its symptoms. NGF has also been reported in Neurology Journal to lengthen the lifespan of nerve cells and prevent neuropathy- the loss of sensations primarily in the feet common in diabetic patients. The stimulation of NGF could potentially prevent diabetics from undergoing amputation due to diabetes-related neuropathy. Other breakthrough findings include the latest research by Biotechnology Chemical Department of Takara Syuzo Company that show that the chalcones of Ashitaba can prevent Alzheimer’s disease as well as nervous system disorders caused by diabetes through increasing the production of NGF inside the brain. Boston Life Sciences has also demonstrated how NGF can re-grow axons within the optic nerve that have been damaged by glaucoma. The success to regrow this axons and neurons show great potential of treating glaucoma-related blindness. 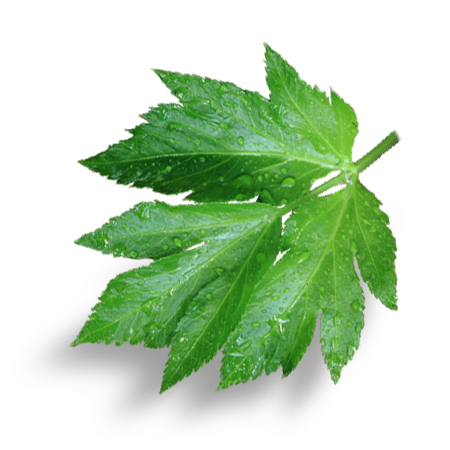 Ashitaba (Angelica Keiskei Koidzmi) is an evergreen plant from the celery family. Many plants from this family are used as medicinal herbs in Chinese medicine for the benefits of their rich antioxidant content. Just like its cousins, Ashitaba has amazing healing properties. The best variety of Ashitaba is found on the Edo Islands, especially Hachi Jo Island, Japan. In the days of the Edo Era, Ashitaba from Hachi Jo Island was also known as the ‘Longevity Herb’. Why is Ashitaba known as the ‘Longevity Herb’ and Hachi Jo Island known as the ‘Longevity Island’? Since the Edo Era, the residents of Hachi Jo Island were known for their longevity. They were rarely infected with diseases such as cancer, irregular blood pressure, strokes, cardiac infarction and Alzheimer’s disease. Researching the reasons for their longevity, studies found that the island’s residents consumed raw Ashitaba daily to preserve their health. Records of Hachi Jo Island also indicated that Ashitaba was the same ‘longevity herb’ which the First Emperor of China’s Chin Dynasty was searching for. What makes Ashitaba grown on Hachi Jo Island different? 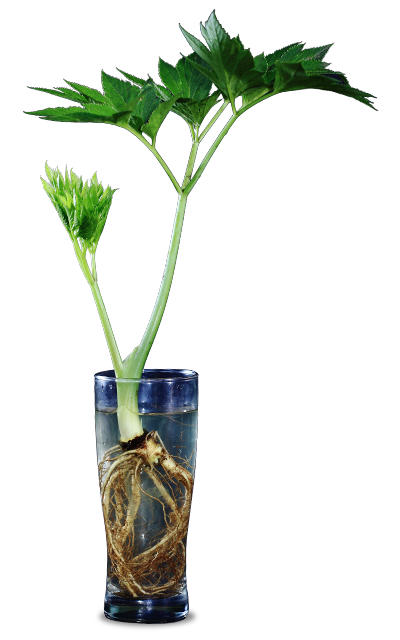 The special soil of this volcanic island in the Pacific Ocean enriches the Ashitaba plant grown on Hachi Jo Island. Ashitaba produced in Korea, Taiwan and other areas tend to blossom prematurely (8 to 16 months), compared with Ashitaba grown on Hachi Jo Island which have a lifespan of up to four years. This makes only Ashitaba grown on Hachi Jo Island has the unique chalcones xanthoangelol and 4-hydroxyderricin. Only organic Ashitaba grown on Hachi Jo Island is approved for medical study and research in Japan. What is a chalcone? What does it do? Chalcones are found in the thick, sticky yellow juice of the Ashitaba’s stem. This yellow pigment is neither flower pigment nor carotene, but rather two kinds of chalcones, xanthoangelol and 4-hydroxyderricin, that possess potent antioxidant activity exceeding that of red wine, green tea or soy. Why is Ashitaba from Hachi Jo Island known as the ‘edible cosmetics’? Ashitaba is valuable for purifying blood and strengthening damaged cells. Long-time users also benefit from smoother complexion. For post-surgery patients, consumption of Ashitaba leads to quicker healing rates of lesions with minimal scarring. Can I take Ashitaba with prescription medicine at the same time? Yes, it is highly recommended to take Ashitaba daily as it can reduce the side effects of drugs and treatment. Ashitaba also provides balanced nutrition and boosts the immune system. Consult your doctor for medical advice.